Parents will stop at nothing to provide the best for their children. Now here is a rare opportunity to learn some useful strategies that can help to nurture learning and help build brain potential in children build. 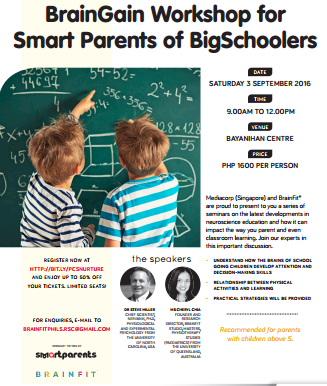 Two international neuroscience experts will share with the latest neuroscientific development in education and how neuroscience can impact parenting / classroom learning on the upcoming BrainGain Workshops this September 3, 2016. Register Online thru http://bit.ly/PCSNURTURE – Early Bird Special P800/attendee till Jul 30 only! Register Online thru http://bit.ly/PCSBUILD – Early Bird Special P800/attendee until July 30 only! Neuroscience is currently so dynamic that this connection, although secure, will inevitably grow and change and strengthen. The parent and educator’s role will increasingly take on an added and “brain-based” dimension — that of remaining open to and curious about a growing field of information. Register Online and Reserve a Slot Now! Did you know that you can create short urls with Shortest and get dollars for every click on your shortened urls. I hope this was a wonderful learning opportunity for parents. I am so happy to see parents wanting to improve themselves, unlike our times, when parenting was more of nurturing at home.